We are all grateful to those who recently donated towards the purchase or renewal of many items used during the Sacred Liturgy, especially at the Traditional Latin Mass, all for the greater honour and glory of God. There are other items that we need. 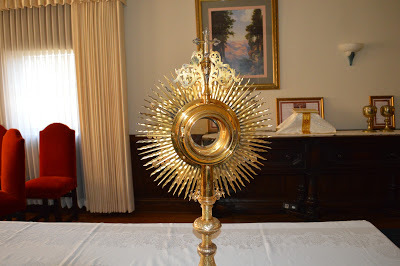 As previously mentioned, we still need to refurbish the large antique (1) Monstrance we have. This is the one made for the Church back in the 1920’s by the German company Hubert Gotzes; it is truly a work of art. It is not now in use because it is damaged and darkened from the passage of time. To restore it to its original brilliant condition and provide a new protective case would cost us about $5,000.00. Since it is such a delicate item, we would need to send it to Adrian Hamers, Inc, in New York to have it refurbished. In addition, we also need to refurbish one ciborium (2), engraved 1910, and two chalices that have been in the parish for many years, but need to be re-gilded. One of the chalices belonged to Msgr. Cornelius Burns (3) and the other one (4) was made by the same silversmith, who made the Monstrance, in the 1920’s. The actual cost to re-do each one is $800.00. The work would be done by Biro and Sons, Inc. on Folsom here in San Francisco. Please contact Father Mazza if you would like to help with the above. Thank you in advance.